The Ethiopian Amhara people originated from Ethiopia and neighboring countries Eritrea and Djibouti. They come from the same descendants as the Tigray-Tigrinya people (see Ethiopian, Tigrinya). Amharic, the language of the Amhara, shows its Semitic origin both in its alphabet and words shared with Hebrew and Arabic. Amharic is descended from Ge'ez, a language extinct since the middle ages. Ge'ez developed from the original Sabaean language, changing through the influence of the non-Semitic languages of the earlier peoples. The Bible is sometimes read in Ge'ez in the Coptic Church. A modern translation is available now in Amharic. Coming from a Semitic ancestry background, they became a unique people as they intermarried and absorbed some of the Cushitic peoples who preceded them. There was a strong Oromo (see Ethiopian, Oromo) strain in the royal family and nobles. Since its introduction in the fourth century and the establishment of the Ethiopian Orthodox Church, Christianity has been a part of everyday life in Ethiopia. In fact, their ethnic identity is intrinsically tied to their religious identity. The majority of Ethiopian Amhara are Coptic Orthodox Christians. A smaller percentage are Muslim. Ethiopian coffee, enjoyed throughout the world, is the Ethiopia’s main export. A good connection point with an owner or another worker in an Ethiopian restaurant is enjoying their food and asking to have a coffee ceremony, a treat in itself especially if the burning of frankincense is a part of the ceremony. 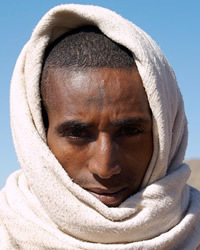 Pray that God will send Christians to minister to the felt needs of Amharic people. Pray that Christians will share a contextualized message of the gospel and plant churches among the Amharic. Displaying 1-30 of 38 results.